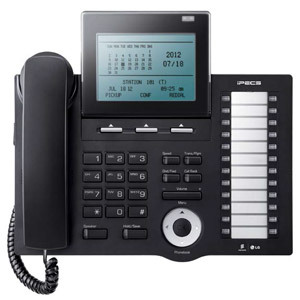 The LDP-7024LD has a 9 line, 32 character graphic LCD with 24 flexible buttons and has call recording. LDP-7000 is replacing LKD with its European trendy design. Informative 3 line LCD, navigation button and menu driven operation show how to enjoy digital keysets. Wide range of selection is also a benefit from the 7000 series. These Ericsson-LG digital telephones meet the diverse requirements for features, reliability, ease of use, and productivity as well as ergonomic user friendly design.